I was saddened this morning to learn of the murder of a Newfoundland Dog in Des Moines Washington. The dog apparently got out of the family's yard and wandered into traffic. Animal control was called, but it was the police who responded. They tasered the dog. It ran into someone's back yard and was followed by the police who shot it 4 times, killing it. All reports, except for those of the officer who shot the dog, was that the dog was frightened, and not acting aggressively towards anyone. I am sickened by this event. Do Newfoundlands "go bad" and become aggressive? Sure, but it is rare. These dogs are known as "The Gentle Giants" because they earned that title. 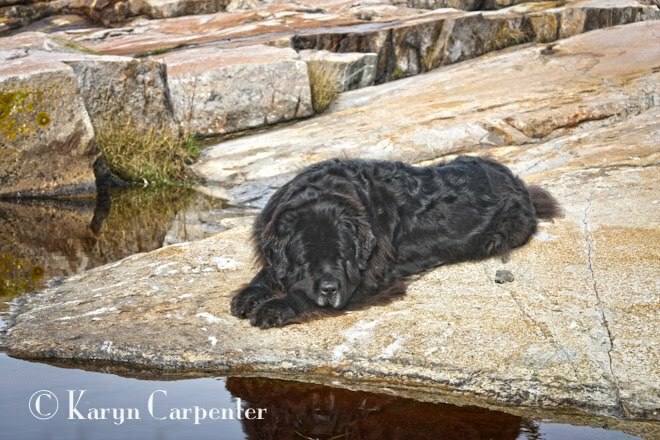 Those of us who have Newfs know that their use as protectors is mostly in the minds of others who might see their size and decide not to chance an encounter. The biggest threat they offer of harming an intruder is that the intruder might trip over them. While their energy levels are not as high as other dogs, they make great search and rescue dogs because of their love and devotion to the human race and throughout Italy, they are adored because they are known for their use as lifesavers on the beaches. Needless to say, the Newfoundland world is up in arms about this tragic event. I encourage everyone to write the Des Moines Mayor and council and to help us keep pressure on the story by sending letters to the Seattle area media. This could have happened to any of us. As hard as we try to keep our pets safe, there are times that they get loose. Police officers who look at killing people's pets as a sport should not be allowed to serve in that capacity and should not be allowed to own a gun. Tonight, Arayo is with friends in Connecticut and I'm home in the Seattle area doing some business. I miss her anyway, but tonight - more so because of this sad story of Rosie. I sent a letter to the Des Moines Police Department. Maybe I should copy it to the Seattle newspaper. You have to wonder about the caliber of person that they are hiring to "Protect and Serve". I sent a letter to the Police chief and will crosspost to other dog lists. Thank you for following up with letters. Letter so the police as well as local and national media is important. We need to keep the heat on this case so it does NOT happen again. As one Newf owner said "you mess with one Newf, you've messed with ALL the Newf owners!"